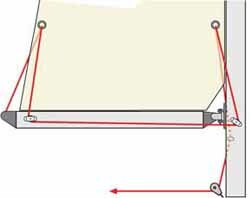 The single line reefing system is probably the easiest way to pull a reef in a mainsail and, providing the mainsail halyard and topping lift are led back to the cockpit, there's no need to clamber up to the mast to shorten sail. 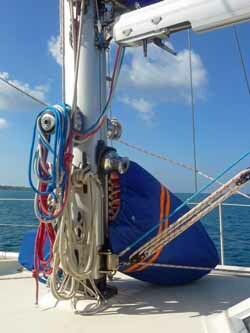 But if the halyard and the topping lift are operated from the mast, then this is where the reefing pennant should terminate too. On some boats the halyard is operated from the mast and the topping lift from the cockpit - which is just plain daft - but if this is the case it's best to keep the halyard and the reefing line in the same location, as you can deal with the topping lift before you leave the cockpit and when you return to it. Clearly it makes a lot more sense to have everything all in the same place - either at the mast or in the cockpit - so you can deal with it on your own if you have to. Adjust course, trim sails - and it's job done! 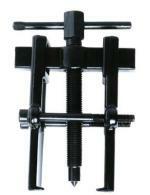 Single line kits for retrofitting along the side of the boom are available, particularly for smaller sailboats. The ones shown here (by US manufacturers Barton and Schaeffer) are for boats up to 30' long. 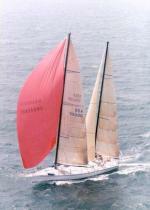 They are complete single-line reefing kits that allow mainsail reefing lines to be led aft to the safety of the cockpit. the mechanical advantage works against you when letting a reef out. There's only enough room inside the boom for the first two reef tackles, so the third reef - if there is one - has to be done with a standard slab reefing arrangement. This means that in the very worst conditions you'll have to go to the mast anyway! I know some offshore sailors that use this system have just two deep slabs in the mainsail, and rely on the trysail when things get really unpleasant. The trysail should have its own separate track and be kept bagged but ready for hoisting at the foot of the mast, as shown here.